(Bloomberg Opinion) -- It’s remarkable what a little money can do. Faced with a declining reserve base and a government mandate to increase domestic production, PetroChina went on a spending splurge last year. 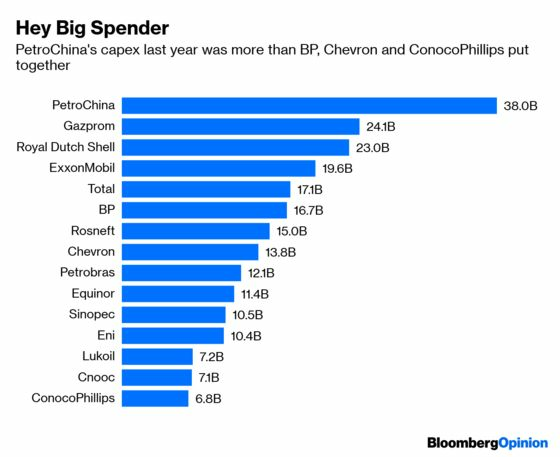 Its 256 billion yuan ($38 billion) in capital expenditures in 2018 was more than was spent by BP Plc, Chevron Corp. and ConocoPhillips put together. It was also about 10 percent more than the company forecast just six months ago, and management isn’t done yet. In reporting annual results Thursday, PetroChina announced plans to further raise the total to 301 billion yuan this year, or $45 billion. Last year’s tsunami of cash wasn’t exactly wasted. For three consecutive years, PetroChina produced more oil than it added to its reserve base, meaning the remaining pool of crude was gradually dwindling. In 2018, that pattern was reversed, with a 1.58 billion barrel increase that represented about 6 percent more oil and gas than was pumped. That’s an impressive achievement. 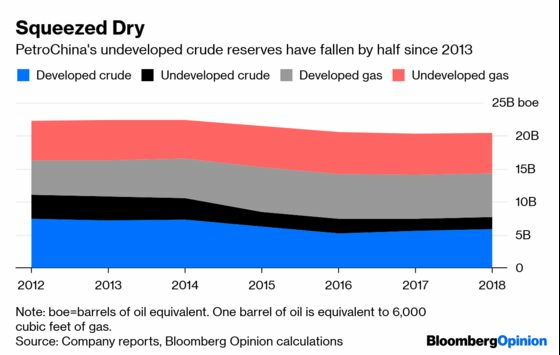 Like the once-mighty oilfields of Pennsylvania and California, China’s petroleum reserves appear to be in terminal decline. Across the country, production fell by about 12 percent over the past three years – one reason why China has overtaken the U.S. to become the biggest consumer of imported crude. PetroChina’s ability to eke out more barrels from that barren landscape is impressive – though even there, it had to fall back on its fields elsewhere in the world, with domestic crude production down 1.3 percent and declining to about 82 percent of the total. The question remains, though: At what cost? For a very rough-and-ready estimate of the price of developing new fields, try comparing the increase in an oil company’s reserves, net of production, to its capital expenditures . On that measure, ExxonMobil, Chevron and BP are all getting new barrels for less than $10 apiece, and Total SA isn’t spending vastly more. 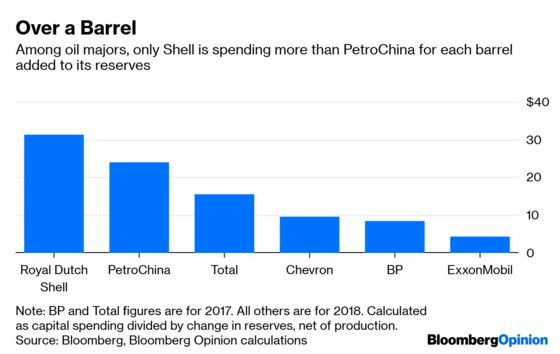 Only Royal Dutch Shell Plc (which has tried to make a virtue of focusing on near-term cash flow rather than long-term reserve replacement) is spending as much for each new barrel as PetroChina. Of course, the apparatchiks in charge aren’t overly concerned about shareholder returns. Chairman Wang Yilin is also the Communist Party secretary of its unlisted parent China National Petroleum Corp., which should indicate where his loyalties lie. 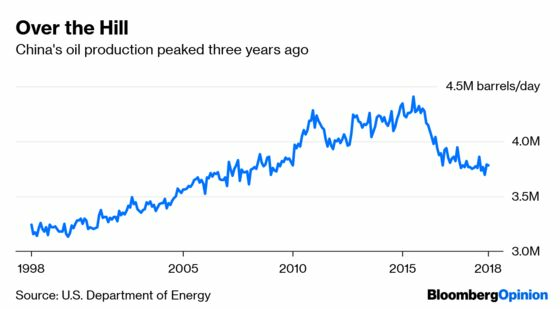 If President Xi Jinping wants to see a reversal of the decline in domestic crude production, PetroChina is going to move heaven and earth to make sure that happens. Still, those who are along for the ride in the listed stocks ought to be concerned. 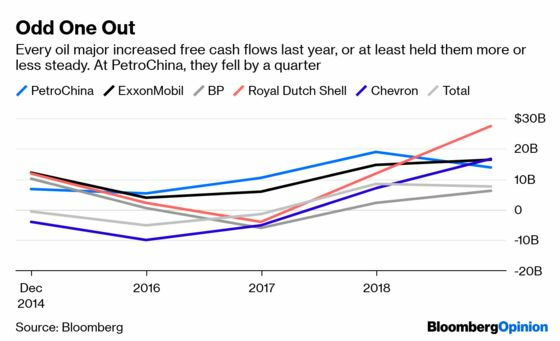 In a year when the average price of oil rose by $14, most of PetroChina’s major peers managed to increase free cash flows, often by impressive amounts. As a result of all that spending, China’s homegrown hero saw the same metric fall by roughly a quarter. There are still positive prospects. An imminent government plan to spin PetroChina’s gas pipeline network into a separate company is likely to be structured so as to prove lucrative for both the gas industry and its shareholders, according to Andy Meng, an analyst at Morgan Stanley. Perhaps enough cash will even be sufficient to unlock a U.S.-style boom in unconventional oil, although we have our doubts. Still, the risks are rising that PetroChina is approaching the point of diminishing returns. If management is to match its target of 906 million barrels of oil production and 3.8 trillion cubic feet of gas output this year without eating into the remaining stockpile, it will need to repeat last year’s impressive performance. That won’t be easy. 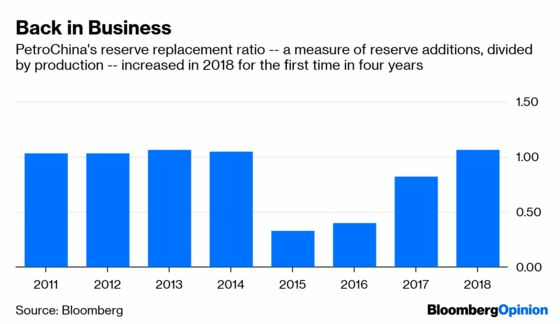 PetroChina’s proven but undeveloped oil reserves – the easiest place to find new barrels – have fallen by half over the past five years, and now represent less than two years of production. No amount of cash can conjure up oil that’s not there. PetroChina should take care it doesn’t spend all its money trying to squeeze blood – or crude – from a stone. This doesn't account for the share of capex spent on midstream operations, and it's worth remembering that most oil majors get roughly 40 percent of output from natural gas. But these six companies are similar enough that they can be approximately benchmarked against each other.